The "all inclusive" Double Door iCrate, folding metal dog crate by MidWest Homes for Pets includes all of the features you will need to provide a convenient, safe & secure pet home for your best friend. 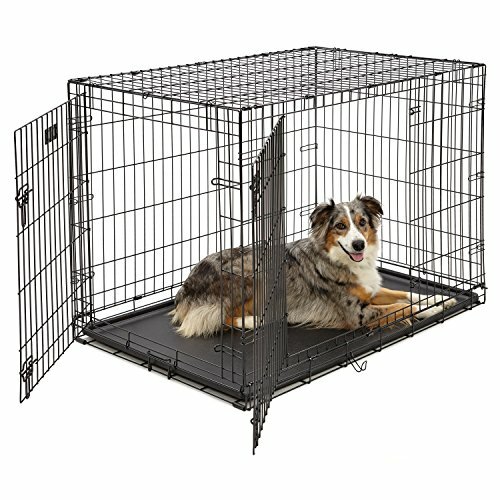 This metal dog crate includes a free divider panel allowing you to adjust the size of the dog crate while your dog is still growing, a plastic leak-proof pan for easy clean-up in the event of an accident, a strong plastic carrying handle for easy portability & rubber "roller" feet on the bottom of the crate to protect your floors inside the home. MidWest iCrates also feature our patented side clips which reinforce the dog crate & reduce possible sharp points ensuring a safe experience for you and your pet. The iCrate Double Door metal dog crate configuration (with front & side door access) allows you to situate the dog crate to best fit your floor plan & folds down for convenient storage. The 42" metal iCrate (model 1542DDU) measures 42L x 28W x 30H inches & is suitable for "Large" dog breeds. **Please note the term “large dog” is subjective. For the best fit, we advise that you check the measurements of the actual dog crate against your dog’s adult weight & measurements. Your dog should be able to comfortably sit upright, lay down & easily turn-around inside the dog crate. When in doubt we suggest you purchase the larger crate option. We at MidWest Homes for Pets understand that your dog is a part of your family & that's why we ensure our dog crates are manufactured with the highest quality control standards creating a safe home for your pet that you can feel confident with. MidWest Homes for Pets stands behind the quality of our products with our “MidWest Quality Guarantee” 1-Year Manufacturer's Warranty. If you have any questions about our dog crates our customer service department would be glad to help you. MidWest customer service can be contacted at: 1-800-428-8560, available 9:00 AM - 4:00 PM, Monday - Friday. Double door folding metal dog crate, iCrate measures 42L x 28W x 30H inches & is suitable for large dog breeds. Versatile 2-door dog crate includes a FREE divider panel, durable dog tray, carrying handle, "roller" feet to protect floors & a "MidWest Quality Guarantee" 1-year Manufacturer's Warranty. Durable design creates a safe place for your pet while you're away & provides for your dog's instinctual "den" instincts. Patented rounded corner clips greatly reduce possible sharp-points your dog's crate for a safer experience for you & your dog.